There are several theories about the origin of the name of Lanzarote: Antonio de Nebrija derives Lanzarote of the words lanza (lance) and rota (broken), because the conqueror Jean de Bethencourt broke a lance when he landed on the island. Though this theory sounds very nice it is far from proven and also unlikely since the Spanish word for broken lance is lanza quebrada. 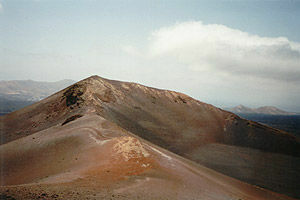 Another theory claims that Lanzarote in Latin is a kind of resin or rubber. There are plenty of bushes called Tabaiba on the island, which produce a sweet and thick sap, which could have given the island its name. Yet another variation is the following: In the 13th century there lived a trader from Genoa called Lancilloto Maloxelo. He used to travel to an island, which was called Tytheroygatra by its natives. He did business with the inhabitants of this island for 15 years and then named it after himself: Lanzarote. According to first visitors of this area there were 6 Canary Islands without the 5 smaller islands, which form the Chinijo archipelago. It is believed that the islands Lanzarote and Fuerteventura were connected then (these two islands and Lobo are not separately mentioned). There used to be a big wall in Lanzarote, which split the island in two halves. This permits the conclusion that there were two kingdoms. The people used to travel to the mountains for sacrifice rituals with raised hands and spilled cups of milk. A crown was found of which it is believed to be the crown of the first king who managed to unite the two realms. The crown is made of goat leather decorated with shells. On the 7th of September the corsair Calafat attacked the island under the order of the king of Fez. He had nine galleys with seven flags and 600 marksmen. The count of Lanzarote could capture one flag and kill 50 pirates but the pirates destroyed the whole island and took more than 90 prisoners.